An RBAET team comprising Lord Justice Floyd, Bruce Harris, Stephen Fash, Adele Fash and Tim Desmond, Chief Executive of the National Centre for Citizenship and the Law and Galleries of Justice Museum, completed the 10k London Legal Walk on Monday 20 May, 2013. This was the 9th London Legal Walk organised by the London Legal Support Trust which raises funds for legal advice charities in London and the South East. Led by the Lord Chief Justice and an array of legal luminaries, over 7,500 participants walked from the Royal Courts of Justice along the Embankment, through Horse Guards Parade and St James’ Park around the Serpentine and back along Pall Mall and the Strand. By agreement with the organisers the funds we raised have been split equally between the LLST and the RBAET. An RBAET team comprising Lord Justice Floyd, Mr Justice Birss, Mr Justice Coulson, Bruce Harris, Stephen Fash and Adele Fash again entered the London Legal Walk which took place on Monday 19 May. This was the 10th Anniversary of the 10km Walk organised by the London Legal Support Trust, which raises funds for legal advice charities in London and the South East. Thousands of walkers, led by the Lord Chief Justice, the President of the Supreme Court and other judicial and legal luminaries, trod the scenic route which takes in many of the iconic sights of London. The RBAET team raised £11,234 which is shared equally with the LLST and was one of the highest team totals of this year’s event. Our share of £5,617 will directly support the development of our education programme and art activities. 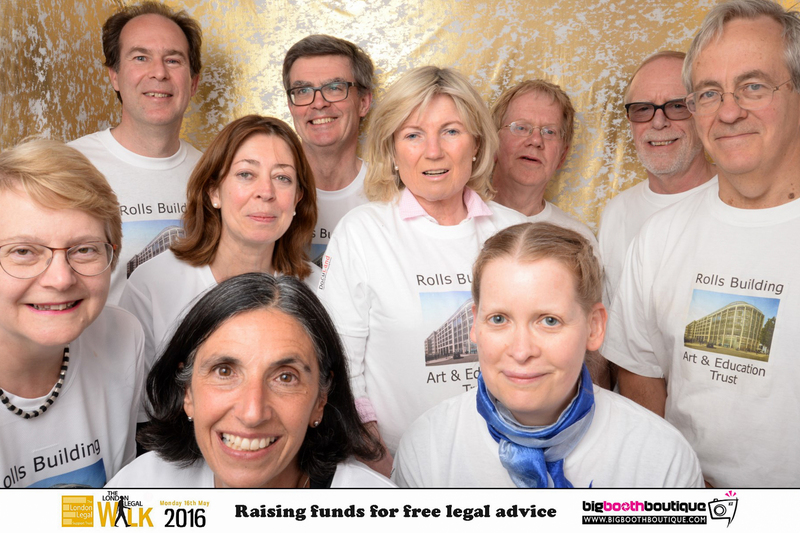 An RBAET team comprising Lady Justice Gloster, Lord Justice Floyd, Mrs Justice Asplin, Mr Justice Birss, Bruce Harris, Sophie Arkette and Stephen Fash secured record breaking sponsorship for the London Legal Walk which took place on Monday 18 May. This was the 11th edition of the annual 10km Walk organised by the London Legal Support Trust, which raises funds for legal advice charities in London and the South East. Led by the Lord Chief Justice and an array of legal luminaries, several thousand walkers set off from the Royal Courts of Justice following a well-trod route through the Temple, along the Embankment, across Horse Guards Parade, through St James’ Park, under the Wellington Arch at Hyde Park Corner, around the Serpentine and back along Pall Mall and the Strand. The total raised was £18,362.50, an average of £2,640.36 per walker which put the RBAET team in 2nd place for total fundraising and in 4th place for fundraising by walker, both out of the 548 teams overall. As before, the funds raised by our team were split equally between the LLST and the RBAET. 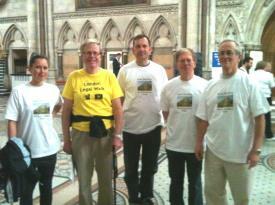 An RBAET team again participated in the London Legal Walk which took place on Monday May 16. The team of Lady Justice Gloster, Lord Justice Floyd, Mrs Justice Asplin, Mr Justice Flaux, Mrs Justice Simler, Mrs Justice Patterson, Mr Justice Snowden, Bruce Harris, Sophie Arkette and Stephen Fash raised £16,645.25 in sponsorship. 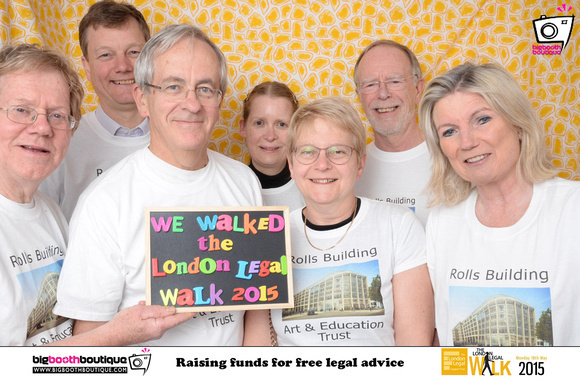 This was a record year for the number of walkers with 10,600 people tramping the streets in aid of the London Legal Support Trust (LLST), which raises funds for legal advice charities in London and the South East. Over £730,000 was raised. The RBAET Team was in first place for total fundraising and 2nd place for fundraising by walker – another tremendous effort from our foot sore walkers. As ever we shared the money we raised equally with the LLST, enabling us both to support the important work of the LLST in facilitating pro bono legal advice and representation for those who may not otherwise be able to access justice, and to raise funds to support our own educational and art programme activities.